If you try to look it up, you’ll find that “refajo” means “slip,” as in the lacy garment that peeks out from under your dress. 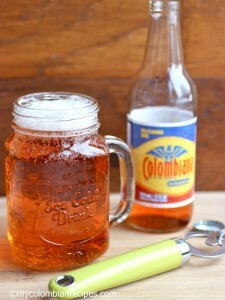 But in Colombia, it’s a refreshing alcoholic beverage, often served at barbecues and other family gatherings. Pour two liters of beer into a pitcher. Add one liter of Colombiana soda and fill the pitcher with ice. You can also add up to 3 shots of aguardiente. This is sometimes garnished with orange or lime wedges. Colombiana Kola (not cola) is a champagne flavored soda with a reddish tint. I can find Colombiana in my local specialty foods story, and in some areas you can find it at Walmart or other chain stores. If you can’t find the real thing, try a hearty creme soda instead. Sit back and have a few sips, while watching Los Tupamaros sing about a spoiled woman (La Chica Gomela) who turns down rum, beer, strawberry ice cream and refajo.